Here is where you need to enter your username. If you have forgotten it, recall that it the username used during installation became part of the computer's network name. You can look in the bottom right of the screen and find the network name of your computer. In this example, the computer name is "jjj-desktop". Therefore, "jjj" is the first login. After entering the username, press "Enter." You will then be asked for your password. Enter the password that goes with your login. You will then see the screen below. Note that, if you are connected to the Internet, a background program will check whether software updates are available. If there are, you will see an indicator appear in the upper right of the screen. 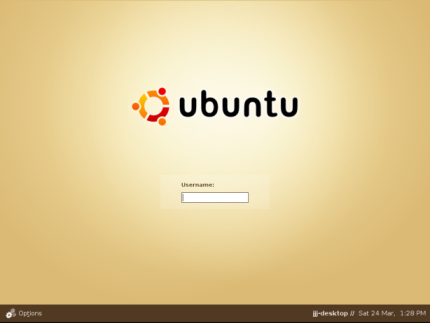 If this update-notifier appears, go to the next page to learn how to update Ubuntu.